Author(s): Isabella D’Ambra, Via Santa Maria a Cubito 687, 80145 Napoli, Italy. Alenka Malej. Scyphomedusae (Phylum Cnidaria, Class Scyphozoa) are perceived as a nuisance due to their sudden outbreaks that negatively affect human activities (particularly tourism and fisheries) mainly because of their stings. A brief review of the history of scyphozoan blooms in the Mediterranean and updated information available after 2010 point to an increase in scyphozoan outbreaks. Whilst the negative effects on public health, aquaculture, coastal industrial activities and fisheries operations are undeniable, the effects on the ecosystem are not well defined. We focus on the trophic interactions between scyphomedusae and fish, highlighting that the negative effects of scyphomedusae on fish stocks exerted through direct predation on early life stages of fish and competition for plankton are at present speculative. In favor of a positive effect of scyphomedusae on fish populations, the reports of predation upon scyphozoans are increasing, which suggests that predators may benefit from the availability of scyphozoans by shifting their diet toward jelly prey. Additionally, scyphomedusae may provide nursery habitats to early life stages of ecologically and economically important forage fishes and other organisms which shelter underneath their bells. Together with these ecosystem services, compounds extracted from scyphozoan tissues and venoms are having a variety of biomedical applications and are likely to contribute to treat a growing number of diseases, including cancer. Our analysis highlights that a re-evaluation of the balance between "positive" and "negative" effects of scyphomedusae on the ecosystem and human activities is needed and provides indications on potential directions for future studies. 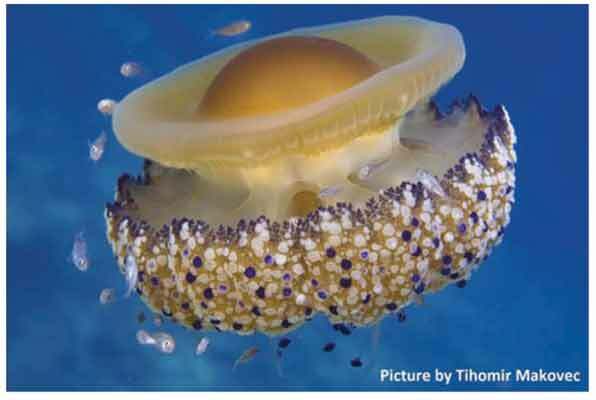 Keywords: Blooms, competition, fisheries, jellyfish, predation, therapeutic applications, trophic interactions. Affiliation:Via Santa Maria a Cubito 687, 80145 Napoli, Italy. Keywords:Blooms, competition, fisheries, jellyfish, predation, therapeutic applications, trophic interactions. Abstract:Scyphomedusae (Phylum Cnidaria, Class Scyphozoa) are perceived as a nuisance due to their sudden outbreaks that negatively affect human activities (particularly tourism and fisheries) mainly because of their stings. A brief review of the history of scyphozoan blooms in the Mediterranean and updated information available after 2010 point to an increase in scyphozoan outbreaks. Whilst the negative effects on public health, aquaculture, coastal industrial activities and fisheries operations are undeniable, the effects on the ecosystem are not well defined. We focus on the trophic interactions between scyphomedusae and fish, highlighting that the negative effects of scyphomedusae on fish stocks exerted through direct predation on early life stages of fish and competition for plankton are at present speculative. In favor of a positive effect of scyphomedusae on fish populations, the reports of predation upon scyphozoans are increasing, which suggests that predators may benefit from the availability of scyphozoans by shifting their diet toward jelly prey. Additionally, scyphomedusae may provide nursery habitats to early life stages of ecologically and economically important forage fishes and other organisms which shelter underneath their bells. Together with these ecosystem services, compounds extracted from scyphozoan tissues and venoms are having a variety of biomedical applications and are likely to contribute to treat a growing number of diseases, including cancer. Our analysis highlights that a re-evaluation of the balance between "positive" and "negative" effects of scyphomedusae on the ecosystem and human activities is needed and provides indications on potential directions for future studies.